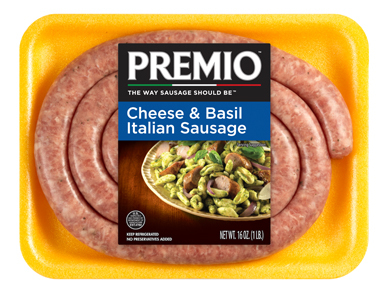 If you want a versatile ingredient you can use to make multiple dishes for your next tailgating adventure, be sure to pick up some Premio Cheese & Basil Sausage. Ideal for savory sandwiches and satisfying sides, this sausage is just what you need for the big game. Having family and friends over for a holiday meal? This tasty sausage will add an unexpected layer of flavor to your chicken or pork loin. Ingredients: Pork, Less than 2% of the following: Water, Salt, Parmesan Cheese Powder [parmesan cheese (part skim milk, cheese cultures, salt, enzymes), whey, buttermilk solids, sodium phosphate, salt], Brown Sugar, Romano Cheese Powder [maltodextrin, whey, romano cheese (cow’s milk, starter culture, salt, enzymes), salt], Potassium Chloride, Spices (including black pepper, fennel & basil), Sugar, Natural Flavors. Stuffed in Sheep Casings. Always cook sausage to a minimum internal temperature of 165° F using a meat thermometer. Pre-heat grill. Place links on grill over medium flame for 15-20 minutes. Use tongs to turn links often until golden brown. Serve and enjoy! Place links on broiler rack at least 7-9 inches below heating element and broil until golden brown (about 10-12 minutes each side). Serve and enjoy! Heat a pan to medium temperature. Add 6 tablespoons water and place links in pan. Cover the pan, continue heating for 10-12 minutes, turning the links often. Remove cover and continue cooking for 5-7 minutes or until golden brown. Serve and enjoy! Refrigerate leftovers within 1-2 hours of cooking or discard. Refrigerate loosely covered for 4 hours before placing in a closed container. Refrigerate and serve within 2-3 days. Medium temperature in a covered pan for 8-10 minutes until internal temperature reaches 165°F using a meat thermometer. Have you ever wished there was an Italian sausage with cheese or an Italian sausage with basil? Well, we can tell you that our Premio Cheese and Basil Italian Sausage combines both of those ingredients to create a flavor you simply can’t find anywhere else. The combination of cheese and basil makes our versatile sausage the perfect addition to any dish. This cheese and basil flavored Italian sausage is so flavorful and filling, it’s also ready to be the star of any meal you make! Packed with flavor, our Premio Cheese and Basil Italian Sausage doesn’t need anything to provide a tasty meal. Simply cook it using your grill, broiler or skillet and put the sausage in a hearty roll to satisfy your hunger. If you’re looking for a way to breathe fresh life into your spaghetti sauce, remove the sausage from its casing, brown it in a skillet and add it to your sauce. Are you trying to resuscitate your kids’ interest in breakfast? Adding this tasty sausage alongside their usual fare or using it to prepare one of the breakfast recipes we have on our website will do the trick! Or, maybe you’re trying to figure out what you’re going to bring to the next office party. You have plenty of options with our Premio Cheese and Basil Italian Sausage. If you want to make our Italian Meatball soup but don’t have our Premio Sweet Italian Sausage on hand, don’t worry! Simply use our Premio Italian Sausage With Cheese and Basil instead for a new twist on an old favorite. You don’t need to have your friends over for the big game to have an excuse to make a mouth-watering dip — you just need to have the right ingredients and a big appetite! While the “official” recipe for our popular Supreme Pizza Dip calls for Premio Sweet/Mild Italian Sausage, you can switch things up and use our Premio Italian Sausage with Cheese and Basil instead. This recipe has already received five stars on our website. Whether you make it with Premio Sweet/Mild Italian Sausage or Premio Italian Sausage With Cheese and Basil, you’ll see why this recipe is rated so highly. Our premium sausage products make it a true taste treat! When you want to cook with a cheese and basil flavored Italian sausage, there’s no reason for you to use anything other than the very best products on the market. Use our store locator to find where are products are sold near you!